Symphony Association founded by Pablo Casals in 1920 in Barcelona, with the financial support of several sponsors and entrepreneurs. Directed by the Casals the concerts would held rounds around Spring Season or Autumn Season. 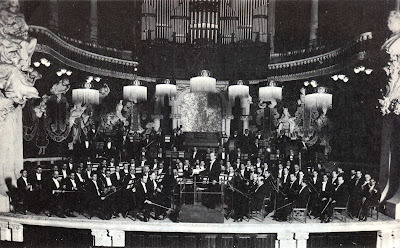 It performed regularly at the "Palau de la Música Catalana" and the Gran Teatre del Liceu. The repertoire he included was mainly works of J.S. Bach and the German Symphonic Masters of the nineteenth century and other works by local Catalan composers like Juli Garreta, Pedrell, Pahissa, Toldrà, etc.. There collaborated great international soloists and conductors, as S.Kussevitzki, Richard Strauss and Igor Stravinsky. It disappeared at the end of 1938. Violins 1: Enric Casals, Juli Jarque, Agustí Torelló, Joan Sala, Manel Giménez, Josep Mª Escolà, Manel Calsina, Enric Nogués, Domenec Forns, Rafel Vidal, Joan Junqueras, Enric Solsona, Josep Porquet, Joan Altimira, Miquel Torrens, Joaquim Mestres. Violins 2: Dino Dini, Santiago Burguès, Francesc Barbat, Salvador Bofarull, Rafel Rosetti, Antoni Bosom, Pau Giral, Manel Salvador, Agustí Carbonell, Antoni Morató, Miquel Camprubí, Pau Dini, Joan Vidal, Tomàs Prunell, Narcís Clà, Enric Gomis. Violas: Joan Ribas, Gracià Tarragó, Francesc Musolas, Alvar Palau, Alexandre Riera, Josep Font, Cassià Casademont, Felip Vives, Rafel Gálvez, Josep Antonés. Cellos: Bernardí Gálvez, Guillem Ferrer, Santiago Volart, Ferràn Pérez, Francesc Clot, Josep Pagès, Josep Umbert, Jaume Piña, Josep Mª Getan, Santiago Torrens. Basses: Pere Valls, Santiago Cortadella, Salvador Escofet, Conrad Bas, Jaume Brusco, Joan Gratacòs, Antoni Montaner, Tomàs Goxens. French Horns: François Lamouret, Alphonse Morin, Ramón Bonell, Pascasi Flores. A good number of cellists have ended up as conductors. One thinks immediately of Arturo Toscannini and Sir John Barbirolli, who had both been fine cellists. An interesting story about Barbirolli has to do with his switching from violin to cello. When just a little boy learning the violin, we would stroll from room to room about his home as he practiced. This so annoyed his grandfather, the he took away his violin, and gave him a cello, exclaiming, "There! Now you must sit still!" Casals had always wanted to be a conductor. Of course he enjoyed playing his cello, but he was entranced by the idea of playing a huge instrument with multitudinous tone colors, and capabilities, as the orchestra is, in a sense. He had never suffered from the "virtuoso mindset" that can easily befall a talented young instrumentalist. Casal's love had always been for the music itself, not for the instrument that played the music. Grunfeld quotes from a letter Casals had written to a friend, "If I have been happy scratching away at a cello, how shall I feel when I can possess the greatest of all instruments--the orchestra?" Casals felt strongly that conducting was his true life's work, though the public will always think of him as a cellist. Even as a child playing the organ in church, he had felt an overwhelming desire to lead the choir, and to give directions to the soloists (see Lillian Littlehales). Casals spent the early 1920's launching his own orchestra in Barcelona. The orchestra's first concert was given on October 13th, 1920, but it still needed a lot of work. Barcelona had a fine chorus already, but the level of instrumental expertise there was low. Casals invested his savings (in todays terms, hundreds of thousands of dollars), and much time and hard work into creating this orchestra, and raising the standard of musicianship to a high level. In fact he gave himself to it with such concentration, that for a time he suffered from a nervous breakdown, and had to rest for several months. After nine years of continuous training, the Orquestra Pablo Casals became one of the finer orchestras of Europe, to Casal's intense satisfaction and joy. Casals organized orchestral concerts aimed particularly at the working people of Catalonia, and derived great satisfaction from seeing the plainly dressed workmen and their families sitting in the audience, listening to the great classics of Beethoven, Mozart and Schubert. Even more than he loved great music, Casals loved people, and he delighted in leading the masses to a higher spiritual, cultural and moral level. This is truly why we still remember Casals today. Not because he was such a great cellist, but because he was a great human being with a heart of love.